Monday 9th The alarm went off too soon at 6:30. Oh, stiff legs and feet! We had a nice cuppa together, and then while one showered the other cooked the toast, then swap. WHAT are we going to spread the butter with? We used our saucers to put the toast on as there were only cups, saucers and drinking glasses in the crockery line and only teaspoons in the cutlery line. Idea! There were some plastic swizzle sticks with a round, flat end like a 20c coin, [forgive me if you’re not Australian. Maybe if you made a teaspoon round and flat instead of oval?] so that would have to do. One problem – we’d had the butter in the fridge. I managed to spread the first piece each and then David was spreading the next pair. Snap! All of the remaining mornings we just used the little 20c sized bit of plastic and kept the butter out of the fridge. Could just as well have used our fingers for the spreading I suspect, but it kept us amused. Then down to the foyer-lounge for another quick cup of coffee, and then outside to wait for the coach to pick us up for today’s trip to Litchfield Park. We saw lots of waterfalls and ‘plunge pools’ and were allowed to swim in 2. There were a couple of walk paths with hills and steps to climb, and all sorts of plants and birds and David found a dear little lizard. David and Phil enjoyed another sight in one of the pools too – a nicely shaped female of the species – golden tan and a bikini the exact colour of the tan! What will I do with him? We were in and out of the bus a fair bit but it was nicely air conditioned in there and people were relaxed and patient. 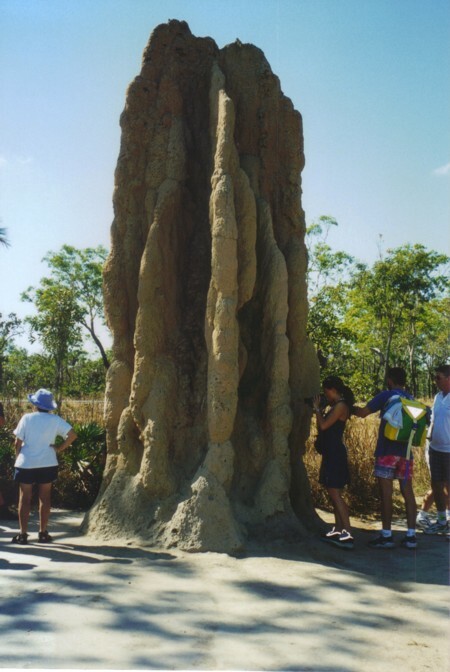 We also saw some massive termite mounds. There were 2 kinds, cathedral and magnetic. The cathedral mounds had a fairly round shaped base, but there were a lot of ‘folds’ to catch the cooling breezes and keep the temperature down inside. The magnetic mounds were on more of a cigar/oval shaped base and were all pointing their narrow ends in the same direction – hence the name magnetic. David and I have a dispute about whether they point North/South or West/East and I can’t find it in any of our brochures or encyclopaedias [this story was written before the web was popular so I couldn’t Google it and therefore I won’t change it from the original], so won’t tell you which in case I’m wrong. Again this is for cooling and heating purposes for the mound. Both types of mound had some very tall specimens. We walked around some that were well over 6 metres high. Lunch, to return to a past subject that was out of place earlier, was a nice little picnic box each with cold chicken, salad, a bread roll, a ‘box’ fruit-juice and an apple. There was a cake or biscuit or something too, but neither of us can remember what it was. We were warned not to leave our lunch unattended or take our eyes of it as the kites [a bird of prey] would swoop down and steal it from our hands if we weren’t wary. We could see them all circling overhead. After lunch, on the way to the plunge pool for a swim, there was a HUGE lizard. I thought David had taken a photo but it seems not. He was about 2 metres long, nose to tail, and had obviously eaten recently as he had a big, round tummy. He just ambled across the pathway and was not fussed about all the people gawking at him. When we got to the water hole there were quite a few Aboriginal children walking around barefoot. When we tried it we said ooch ouch because of all the little pebbles. They must be really tough! David went in to the water amongst the palms when one chap asked if he had seen what he was swimming with. There was a small lizard on one of the palm trunks. David said something about maybe not swimming after all and the chap said “That’s nothing. You should see the one that chased him up there!” We think he was joking. David did swim. I didn’t feel much like inflicting my bathered body on the world, especially after lunch, so walked into the water knee deep, trousers and all, and sat on the side of the entry steps and happily dangled my lower legs in the water, watched the other people go in and out, and looked at the twin waterfalls coming into the pool. My trousers were just a light cotton and dried in about 2 minutes once we got out of the water. Tuesday 10th Stiff again when we woke up and more toast spread partly with our fingernails for breaky. Officially this was our other free day, but we had decided what we wanted to do. Off to the hire car place next to Delicious Blue and got a little Ford Fiesta for the day so that we could go to the Territory Wildlife Park. 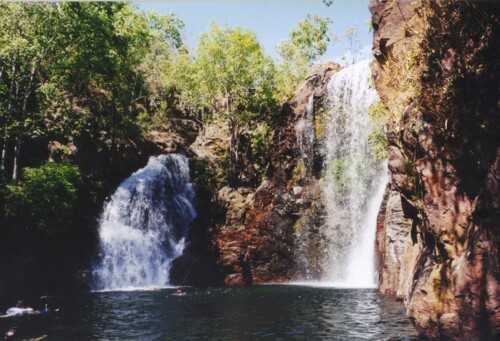 Everyone who had been to Darwin said ‘Don’t miss it!’ but the only way to get there was to catch a tour coach which would only stay for ½ a day and then go on a jumping crocodile cruise in the afternoon. Nah! We wanted to stay all day and forget the crocs, so had to drive ourselves. Interesting little car. Sounded as if you were asking the world of the engine, and we were in 5th gear by the time we were doing 70 kph, but she eventually got up to 110 kph and sat there happily enough for the journeys. David drove there and I drove back so that we’d both had a turn. The brochure for the Wildlife Park says ‘45 mins drive south of Darwin’ but I think it was about 70 kms as distance means more than time. We got there and back within our 150 km allowance for the car.